accessible from City Center Drive. (accessible from City Center Drive) or in the underground garage. Carmel City Center parking details can be found here. We are available beginning at 10:30am Monday - Saturday. We are looking for energetic & hardworking individuals to join our team! Positions needed are host, server, food runner, busser & line cook. Please visit us to apply. 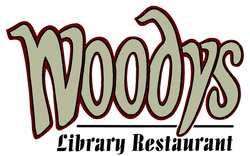 Established in May 1998, Woodys Library Restaurant is also owned by husband & wife team, Kevin “Woody” & “Chef” Richelle Rider. The title of the restaurant, originated from Kevin's nickname, Woody. It is perfect for those looking for a memorable & personal dining experience. Woodys serves lunch & dinner in a unique bi-level establishment with upstairs dining, a downstairs neighborhood pub & outdoor patio seating.